70+ Oriental Cyber Enemies including: Robo-Rakshasas, Manticores, Nephilims, Magnetic Fakirs, Bazaar Guards, Opium Lords, Rukh Birds, Genies, Giant Silkworms, Assassins, Nano Modified Ghouls, Deadly Laser Satellites, Flying Golden Sportcars and Palaces. 4 Original Bioms(Tower Districts) with unique ways of vertical movement, enemies and traps. Each more deadly than the last. I assume by "biom" they mean Biome, sure sounds like it. 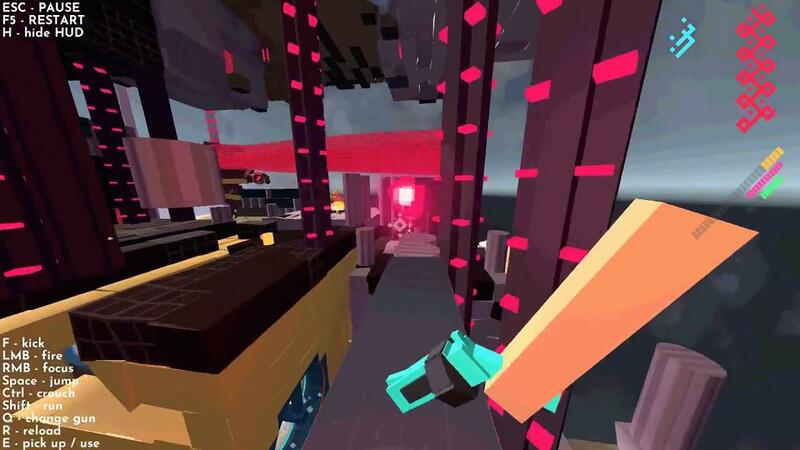 In 1001st Hyper Tower, the developer says that every structure is destructible and so you can really go wild. Sounds interesting, looks pretty good too! I spoke to the developer on Twitter, who confirmed Linux support. As for the world, it's a "Arabian Cyberpunk world" the developer claims is like "Prince of Persia with a plasma gun". You can follow it along on Steam, releasing March 11th. The visuals and sounds are not attractive at all, for me. I don't care about low tech, low poly, pixel, ascii etc, but this is bad design (colors, shapes...). Tchey The visuals and sounds are not attractive at all, for me. I don't mind the graphics, but I'm in agreement with Tchey about the sounds. They sound like something I would've heard 35 years ago in a C64 game, which is a pity. It detracts from what looks like an otherwise novel take on the FPS genre. I've wishlisted it and will watch it. Maybe I can convince the devs to change out their sounds for something from this century. Nanobang I don't mind the graphics, but I'm in agreement with Tchey about the sounds. They sound like something I would've heard 35 years ago in a C64 game, which is a pity. It detracts from what looks like an otherwise novel take on the FPS genre. Hi there! Tx for wishlisting! I know the sounds are lame( They are combined from free assets, because I haven't enough money/time for them yet. Was concentrating on a playable build. But that's unacceptable, and they will be replaced on release for sure! The music in the trailer is really good! That almost makes me want to play it. "Prince of Persia with a plasma gun" ok, you've got my attention. lol. I would not want to fan the flames of a 35 years old war but i would say the sounds look more like those of a speccy than a C64. And the colour combination needs some work. But i am curious about what an Arabian cyberpunk world would look like. That said, i wish the dev good luck and i hope this game will find its public.